When Carl Sagan said that we are made of star stuff, he wasn’t just using flowery language to appeal to your imagination; we really are made from metals formed in stars. Keeping track of these metals is not only important to our understanding of where we come from, but it is also vital to understanding the history of the stars. But before we can dive into the role of metals in the history of stars and ourselves, we need to know what astronomers mean when they use the term metals. We aren’t referring to the conductive elements on the left of the periodic table. We mean any element that is not hydrogen or helium. The amount of these other elements determines a star’s metallicity. The first stars formed in the Milky Way consisted mostly of hydrogen and helium. As the stars’ central temperatures and pressures rise, nuclear fusion begins in the center of the star. Nuclear fusion is a process wherein lighter elements combine to create heavier elements while releasing energy. Low mass stars, like our sun, create lighter elements such as carbon and oxygen, but cannot produce the heavier elements. Massive stars, on the other hand, quickly move beyond these more light elements to create heavier elements like silicon and copper. 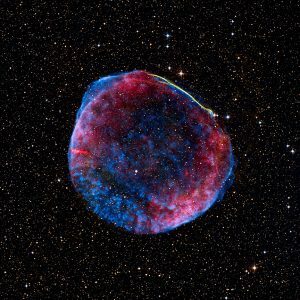 Anything heavier than iron is created during a supernova–the star-shattering explosion at the end of a massive star’s life cycle. The metals found at the surface of a star originate mostly from the cloud of gas in which a star is formed. The abundance of metals present in these gas clouds builds up over time. 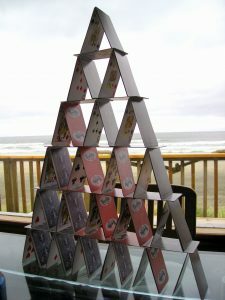 Rather like building a card tower, you can’t build a five-level tower unless you have five supports on the bottom row. It can take a long time to build up to that fifth level and sometimes you have to start over. A similar process happens with stars. Just like building a card tower, heavier elements in stars cannot form unless the lighter elements are already present to be used as building blocks. The pinnacle pair of cards cannot be placed without each layer below being already built. The first generation of stars in a galaxy may create heavy elements like nitrogen and oxygen and then expel these elements in a planetary nebula or supernova. After some time, newer stars will begin to form with these leftover elements already mixed in. These stars, born with more metals than the previous generation of stars, will follow the same evolutionary steps. Similar to card towers: this process of building is easier if someone were to give you a four level tower already and you just had to place the fifth level. Astronomers take advantage of this fact to determine the relative age of a cluster of stars. Using spectroscopy, we can identify elements present in the light emitted by the star. Since we are using the light emitted, we can only measure the composition of the surface of a star; astronomers must make educated guesses about the new metal atoms forming inside of the star. If a star cluster contains only very small amounts of elements such as oxygen, iron, and gold when compared to our sun, the stars were likely very early stars, and hence very old. Yet if there is a large abundance of all elements compared to our sun, then they must be formed from the remnants of previous explosions, making them part of a much newer generation. It took many generations of stars exploding before there was a large enough abundance of complex metals to create humans, let alone everything else in the universe. But now that we are here, it is only fitting that we should use our eyes to look up at the night sky and study the stars, our earliest ancestors. Edited by Briana K. Whitaker and Riddhi Sood.